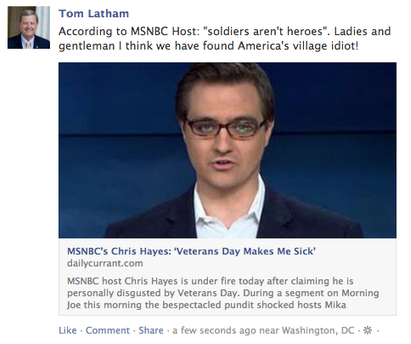 Rep. Tom Latham (R-Iowa) castigated MSNBC host Chris Hayes this week, calling him "America's village idiot" in a Facebook post. Latham, however, ended up being the one looking uninformed, when he found out that he based his criticism of Hayes on what turned out to be a satirical article. On Monday, Veterans Day, the Daily Currant published an article claiming that Hayes was personally disgusted with the holiday. "I don't know about you, but Veterans Day makes me sick," the article in the satirical publication quoted Hayes as saying. "It's just such a jingoistic, macho display of violence and power. I saw a parade while biking to work this morning and I literally felt like vomiting." Latham, in turn, was disgusted by Hayes, going after him on both Facebook and Twitter. In a tweet that was removed, Lantham wrote: "Disgust from MSNBC host for the very men and women who fought for his right to state that 'soldiers aren't heroes.'" Politwoops, a project of the Sunlight Foundation that captures tweets deleted by politicians, noted that Latham deleted the tweet 21 seconds after it went up. Latham later apologized to Hayes via Twitter after realizing the comments were satirical. When satire attacks! My apologies to @msnbc host Chris Hayes. In 2012, Hayes came under attack from conservatives for saying on his show that he was "uncomfortable" with the term hero because "it seems to me that it is so rhetorically proximate to justifications for more war." He later apologized, saying in a statement to the Daily News, "As many have rightly pointed out, it’s very easy for me, a TV host, to opine about people who fight our wars, having never dodged a bullet or guarded a post or walked a mile in their boots." Latham's attack on Hayes comes weeks after he and other GOP members voted for food stamp cuts that would kick 170,000 veterans out of the Supplemental Nutrition Assistance Program.